Scientific Name(s): Mimosa monancistra Benth. Image Permissions: Please contact the copyright holder for permission to use. Photographer(s) Appreciation: Thank you yet again to a former coworker, David Tarrant, for sharing a photograph from Mexico. Like the Matelea pilosa, it was also taken in El Charco del Ingenio in San Miguel de Allende, México. From what I’ve been able to discern, this is one of the few photographs online of Mimosa monancistra (I was also able to locate an image of a dried specimen). I’m always pleased to have uncommon or rarely-encountered plants on BPotD. In Mexico, the common name for this plant is una de gato, or cat’s claw (or catclaw). The genus Mimosa, as currently recognized, has 712 accepted and provisionally accepted taxa, according to the International Legume Database and Information Service. Of those 712 taxa, just over 250 are marked as provisional, suggesting that the taxonomy surrounding the genus is confusing. Dr. Rupert Barneby, writing on the number of species of Mimosa in Brazil, noted that “it is unlikely that an end to discovery is in sight” (source). Dr. Barneby was referring to the number of narrow endemic species occurring on high-altitude islands of campo cerrado (savannah woodland) and campo rupestre (open rocky landscapes). The barriers to interbreeding between populations of these environments, combined with time and selection pressures, has led to many mountains having their own distinct species of Mimosa. 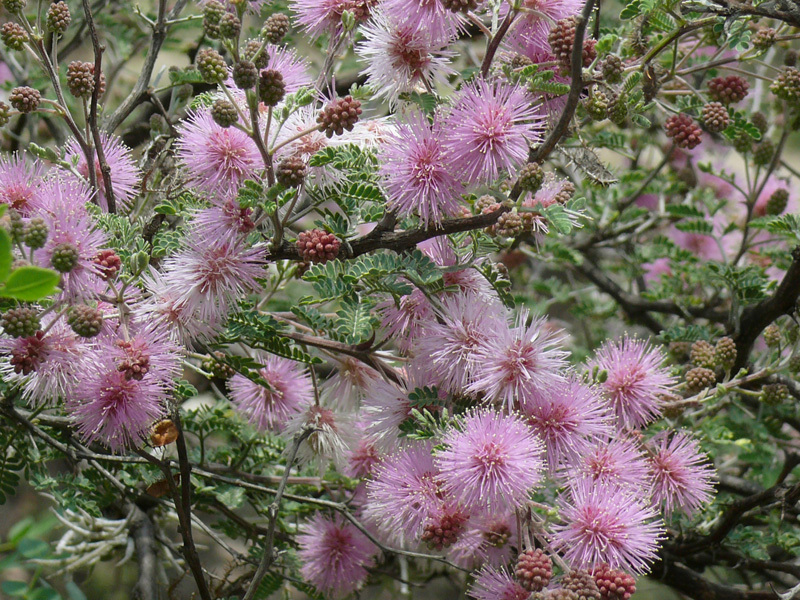 Mexico also has its share of endemic Mimosa species (including today’s plant), though the endemism found in Mexico is partly due to the selection pressures of different local soil conditions. Mimosa, mi-mo-sa; from Gr. mimos, imitator, referring to the sensitivity of the leaves to touch or injury. Plant Names Simplified, Johnson and Smith. I just love this stuff!! Speciation occurring on isolated ‘high altitude islands’. Selective differentiation driven by ‘different local soil conditions’. It is so rich and so precious! Let the gratitude and wonder flow! This is what energizes us to step into our unigue individual roles in these changing times. May it be so! Wonderful photo and write-up, Daniel. Thank you! Growing up in Newburyport Massachusetts, which was a clipper ship town on the Altantic ocean. I remember a Mimosa tree that was so beautiful. It grew in a sheltered garden and was brought home on a clipper ship in the 1800’s. Thank you for bringing back such wonderful memories. The picture is so beautiful. Stunning photograph. The lighting is perfect. I’m always glad to see a Mimosa I haven’t seen before. This one is a beauty. I grew up in Philadelphia, Pennsylvania, which is a wonderful mingling of north and south biologically. The large Mimosa in the neighboring yard always seemed an exotic and improbable portal into a more tropical and primitive world, blooming and spiring in the sun, bracketed by darkling spruces! Great post, photo and comments. George, it’s nice to know nature is still doing its thing despite all our efforts to interfere….. I, too, love the U.S. east coast Mimosas, although many of them have succumbed to a “blight” (not sure this is botanically correct term). But the color of this one in the photo is stunning! Is this the “Catclaw” vine that is sold in nurseries in Tucson? If so, I will get one because it looks beautiful. I tried to grow one once, but it didn’t make it. (I like plants that have to do with cats.) The Catclaw vine that is sold here in Tucson can damage walls I heard, thus the name. P.S. The flowers seem very similar to our Pink Fairy Dusters which bloom in the spring. The color of the flowers evoked Jacaranda memories, too. Brings back such sweet memories of the beautiful mimosa trees in the town where I grew up in Gulf Coast Texas. And in the South one pronounces the first syllable ‘muh,’ as in mother, for ‘muh MOE suh.’ Lovely, lovely trees, but one had to watch out for cut worms that would ring a branch and eventually drop it off. Does anyone have any helpful hints to care for a mimosa tree in the Desert region of Oregon whose branches are dying and leaves & blossoms falling off…. Poor Momma Mim…. can any one please suggest anything to save her? Actually, the very widespread tree in this country usually referred to as mimosa is Albizia julibrissin. As a child I used to sit on a large branch on our Mimosa with a book and read. My favorite spot. I just bought three, that look like this one but mine are red with fatter rounder leaves. Very lovely tree. And the photo, another beautiful study in pattern, colour, texture. I wish this tree could survive Toronto’s winters. I’d plant a bunch of them, everywhere. How I can get permission to upload this photo to Wikimedia Commons? I am writing an article about Mimosa monacistra and I really like to use it. From already thank you very much. Leave a Reply to George L. in Vermont Click here to cancel reply.